First of all, when coming downtown for the best bartending course in Vancouver, grab a coffee. Fine Art Bartending Vancouver is located at 432 West Pender. We are only 2 blocks from the Granville Skytrain Station, and only 3 blocks from Waterfront Station. Our contact page has a small map, and our contact details too. Note that we are located on West Pender Street. We have just a small storefront, but you cant miss the big “Learn To Bartend” sign on the window. We also have a sandwich board out front too in case you are walking by. Come on in! The door is just to the right of our big window sign. One of us will meet you at the front desk and get you checked in. We try to keep things friendly and informal. Next, head into our classroom. Grab your textbook from the bar and start flipping through the 150 pages of essential bartending knowledge. Your instructor will of course say hi and outline your starting tasks to get you behind the bar immediately. Head into our classroom & meet your instructor. Now its time to get started! After a short introduction, your instructor will begin to introduce you to the training set up of our very long bar. Just like any bar, we point out which bottles go where & why. Do you know how the pop/soda guns work? We also talk about the BC Government Serving It Right Program. Brief explanation of the program, how it works & your responsibilities around serving alcohol. After a short demonstration on proper pouring techniques with the pour spouts, time for you to get up behind the bar for the 1st time! After you familiarize yourself with your new working environment, time to work on some precision pouring techniques. 15 minutes of focus and you will be a master of single shot pours and double shot pours. With practice, you will also be able to nail free pours and more. It is very important to be precise and not spill. Bar managers do not like a bartender who isn’t in total control of the inventory. Sit back down & we can talk about how different drinks get put together. Why & when you would build, shake, stir, strain, muddle, blend or layer a drink, and what each method looks like. We also offer up for sale a bar equipment practice kit specifically created for our students. All the equipment you see in the school is sourced from local bar supply companies, so you know these are the same pieces used by restaurants and bars throughout Vancouver. The instructor has all the details and can set you up with one of those sets before you leave for the day. Practice your pouring at home! Next we talk about whiskey. Canadian, Scottish, Irish & American. What its made from, and what drinks we can make with it. Your instructor will carefully demonstrate 6-10 recipes, all made with whiskey as the base alcohol. Now its your turn. Back up behind the bar you go to work your way through each of the recipes. Some recipes need to be memorized, some don’t. 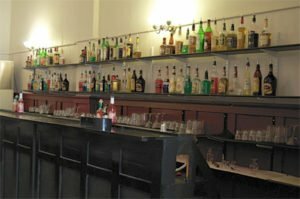 The important thing is to spend the time up behind the bar, working your way through recipes, finding all the various liquors, liqueurs, bitters, syrups etc.. The first day it can be a little overwhelming, but every drink you make you get a little faster, a little more confident & a little smoother. It takes many hours of pouring drinks to look like you know what your are doing, and that is what your here for, hours and hours behind the bar, repetition, making order after order. 7 more days of this & you will look like a pro! We wrap up the 1st day with a lesson on modifiers. Starbucks baristas can deal with dozens of modifiers to their coffee drinks without blinking an eye, (decaf, non-fat, extra shot, half-sweet, no foam etc..), and we bartenders have a dozen of our own we need to get comfortable with (short, tall, double, half-ice, neat, back, side, extra spicy, sidecar of soda, loaded, etc. etc..). 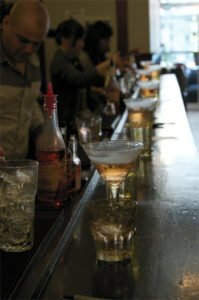 We take you through all of these, and after 8 days of working with modified drink orders, you wont even think twice when your customer requests 3 modifiers for their cocktail. After everyone is set-up, warmed up, and refreshed on what we worked on yesterday, time to get into some new concepts. Why are some sweet, and some taste like nothing? Why are some brown and others clear? Can I make it in my backyard? These and a few other questions are covered along with a few interesting stories. Back up behind the bar everyone! Now that you know a few recipes, we can start throwing a few curve balls at you. Yesterday you learned how to make a Whiskey Sour. Now make me an Amaretto Sour, a Vodka Sour, a Banana Sour? Many recipes are really just a guideline, they are important to know, and this 20 minute drill teaches you that customers can request major variations of these recipes you are now familiar with. After this exercise, no weird variation on a popular recipe will ever throw you for a loop. Tips are good. How do we make tips, there are several ways. To make the maximum amount of tips possible, we need to talk about 2 things, how to deliver exceptional customer service, and upselling. What exceptional service looks like. Why its important. How can we upsell in a way that makes the customer feel like we are trying to help them get the exact custom/tailored drink they really want. What can we upsell. These are all big topics, and we will continue to touch on them throughout the rest of the course. Hopefully by now you are seeing a pattern with how our classes work. We talk about a concept, then we get up behind the bar and do it. We talk theory, then we get up behind the bar and do a drill of some sort. The first couple days have a little more theory/discussion, just to get you really familiar with everything and get you into good habits. Day 3 onward, you will find you are spending much of your time up behind the bar, working through recipes, efficiency, customer service, upselling, streamlining, multitasking etc.. and much less of your time talking/discussing theory. 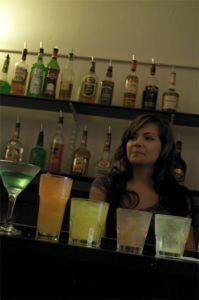 Fine Art Bartending has the most hands-on time of any bartending school around. We make sure that practice is done every day or night. Repetition is the key to success. Having a few excellent instructors also helps. Today we focus on a review of the gin cocktails and martinis. now added to your repertoire. Liqueurs consist of Baileys, Sambuca, Amaretto, Kahlua, and Jägermeister. The list goes on and on. Each is very different, including how they are made. Learn why they all taste so different, various types & flavours. Jump back behind the bar and run through some liqueur based recipes. Brandy & Cognac, where it comes from, what makes a $500 bottle versus a $20 bottle, how to serve. Back behind the bar for a customer service drill. Recommending cocktails to customers based on what they like. Its not an easy one, but its super important to be able to apply all your new bartending knowledge to actually make customers great drinks that they will love, taking into account the customer’s taste. What makes a great vodka vs a cheap vodka, popular brands. Vodka based cocktails. This is a big topic. Vodka is the most popular spirit by far, so there are a lot of them. The Fine Art Bartending Training Manual is constantly being revised and updated to capture popular vodka drinks, but we can’t capture them all. Again, you don’t have to memorize every cocktail, but there are certain recipes that every bartender should know. Streamlining & efficiency. With over 30 years of teaching at Fine Art Bartending, we have a few tips and tricks we have picked up over the years. Basic tips that every bartender should know… but many don’t. Another big topic. As long as you are a bartender, you will never stop working on being efficient. But it all starts here, making 2, then 3, then 4 then 5 different cocktails at the same time, never touching the same bottle twice, not turning around and walking over to find ingredients any more than is absolutely necessary. Just generally being efficient. 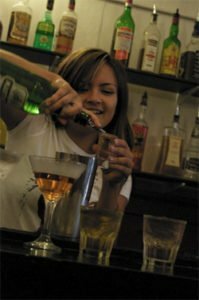 The difference between a fast bartender and a slow bartender has nothing to do with how fast they move, and everything to do with who is being more efficient with their movements. Review of Vodka Drinks Practice session using your new efficiency techniques, no more making 1 drink at a time, we start the day with many rounds of three drink orders, focusing on efficiency. Tequila, how its made, what makes a great tequila, tequila based cocktails. Demonstration & then your turn to get up behind the bar & master the few tequila based cocktails. Hot drinks, Specialty Coffee’s, Blueberry tea, there are so many to learn. Rum, how its made, different types, & rum based cocktails, back up behind the bar you go to master the rum based cocktails. Shooters – Popular recipes, different preparation methods, up behind the bar to try the techniques. Of course a big practice session of all the drinks we learned last week to start the day, focus on efficiency. Review Tequila & Rum Cocktails. Big practice session to start the day, 20 or so rounds of 3 to 5 drinks each. Important to keep bartending, every day, keep at it, confidence keeps growing, and your starting to look like a pro. Quite a difference from day one! Beer time. Lets talk about how beer is made, and then outline different types of beer, kegs versus bottles, how keg systems work. Of course there has to be a little time spent on pouring and serving beer. From that point, we have you move back behind the bar, time to work on your memory. In busier places, customers give you 3 to 5 drink orders, and you don’t see bartenders writing orders down, they work from memory. We will give you some tips and tricks to help remember drink orders. ​Wine – Even if you don’t like wine, to work in a bar you definitely need to know some basics. What are grape varietals, different countries that are important in the wine world, what wines go with what food, sweeter wines versus drier, what is a dessert wine (port, sherry, ice wine etc..), sparkling wines & champagne. A good round up of the basics to get you started into the world of wine. No need to stress about it. The exam is a relatively short written exam. You should know your stuff now, and that will make these simple questions that much easier. 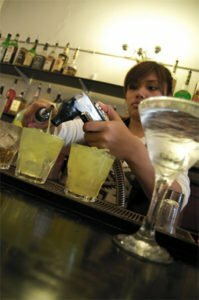 Bartending is not just about what you can write down though, there needs to be a hands-on exam as well. Of course we get you up behind the bar for your practical exam where you make a few select cocktails for the instructor. How to look for a bartending job. The bar and restaurant industry is quite different from most. Its worth taking 45 minutes and talking about how to go about looking for a bartending job. 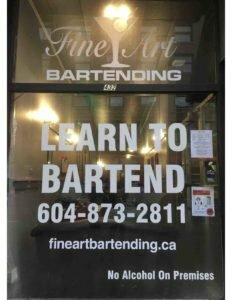 Fine Art Bartending Vancouver has been around the longest of any bartending school in Vancouver. We are constantly looking for easy ways to improve the school. Over the years we have had a pile of suggestions and we slowly work many of those bits of input into the school and program. Hopefully this gives you a pretty good idea of what its like to attend our program. The majority of your time will be spent behind our bar, bartending. And about a third of the time we will sit and discuss the theory side. You are up and down a lot, and the time flies by. We also have a bit of a summary of what you can expect from your 8 days of bartending classes. We also have the details of these classes summarized in a table for easy viewing, and also as a brochure for those of you that like graphics instead. If you take our weekday or weekend classes, and you feel you missed something, you are welcome to come back. Even if you just want to repeat a single class, you are welcome to return for a day or night anytime, no charge, forever. That’s the Fine Art Bartending Guarantee.